Prime minister’s outburst follows warnings of war if his party loses elections. 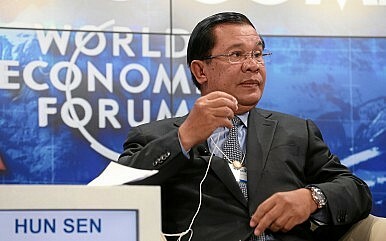 Cambodian Prime Minister Hun Sen brushed aside international etiquette this week and used his country’s first World Economic Forum (WEF) as a platform to justify his crackdown on political dissent and to threaten journalists who fail to toe the government’s line. RFA is funded by the United States and last month its deputy director for Cambodia, Huot Vuthy, fled the country over allegations that he falsely identified himself as an assistant to the opposition Cambodian National Rescue Party (CNRP) during a prison visit. The Cambodia Daily is owned by American family interests. Those used to Hun Sen’s pronouncements would not have been surprised by his latest outburst, which came in response to questions at a press conference. But it did astonish international delegates and other media who came here expecting Phnom Penh to show off her friendlier side. Business leaders had also hoped Cambodia would use the WEF to improve its reputation, often maligned by allegations of corruption and human rights abuses, as opposed to politicking ahead of commune elections on June 4, and a national poll not due till July 2018. Under the headline, “Hun Sen Hijacks Forum Session to Scold Media,” the Cambodia Daily insisted, “Our mission is unbiased news, without fear or favor” and quoted Tripti Lahiri, Asia bureau chief for website Quartz, who also said she was surprised by the outburst. “The prime minister spent the bulk of his answer criticizing the outlets the reporters worked for, instead of responding to two reasonable questions,” Lahiri said. Garments, tourism, construction, and agriculture are key planks of the local economy, which has led regional GDP growth of more than seven percent annually in recent years. Technology, youth, and the digital era were suppose to be major themes of the WEF. But on the eve of the forum Hun Sen also repeated earlier warnings that Cambodia would return to civil war if his Cambodian People’s Party (CPP), in power since ousting the Khmer Rouge in 1979, is not returned at national elections in July next year. “The Cambodian People’s Party must win elections, every election … War will happen if the CPP does not control the country anymore,” he told a gathering of war veterans from Cambodia’s three-decade conflict, which ended in 1998. Hun Sen alone controls the Royal Cambodian Armed Forces. His personal body guard unit numbers around 3,000, and while some military units are sponsored by private business, many Chinese, they too owe their allegiances to the prime minister. Some were present at the WEF. The WEF turned down some media applications to cover the event, citing “space constraints.” It also has declined to answer any further questions from this journalist. Those rejections came on the heels of complaints the Cambodian government is becoming increasingly selective in choosing friendly reporters to cover its press conferences and events. Hun Sen has also previously said he had his own people working inside Cambodia’s media industry, including the Phnom Penh Post. What’s Behind the Sale of a Cambodian Newspaper to a Malaysian Investor? The sale is raising fresh concerns about the state of press freedom in Cambodia.